As a private music teacher with a waiting-room area for students, I set out to make it a welcome place where some undirected learning could happen. I managed to find a lot of books with coloured illustrations about music in general: the history of instruments, lives of composers, how sound is made, instruments of the orchestra, musical periods and what characterized each. But it doesn’t all have to be about Music! Some were about Science and Geography, some were joke books and children’s picture books. Generally, have things sitting around that stimulate the brain. Visit a supplier of Brain Toys: look for things they can manipulate without making any noise. There are sand-pictures created by tipping a glass container full of layers of coloured sand (ever-changing landscape) and a similar one with coloured oil in water (the oil descends and spins mini-turbines in a chain reaction). I built up a collection of Magic Eye books and though it was nothing at all to do with music, nevertheless they made the waiting-room a place families were eager to get to each week – and I’m not just talking about the children! One mother sat an hour each week through her two children’s lessons with her head in these Magic Eye books. Include jigsaws, foam shapes to make patterns, and younger siblings will happily sit on a mat playing quietly, wanting to be grown up enough to be learning music too. I had a container of Plastic Animals A-B-C-D-E-F-G for beginners to place on the piano keys: younger siblings wanted to use those for their own purposes, happily making paddocks on the floor! Start to collect music posters or make your own. Put up mottoes with positive thoughts or with a question the child has to answer, and draw students’ attention to them when applicable. Have a computer accessible to them: I keep an old one just for that purpose, with CD-Roms about ethnic instruments, composers etc. made available – old but useful technology, and you will discover newer if you look. It helps if this computer is in an area where sounds from it will not disturb the current lesson. Perhaps add some items of ethnic interest, since playing music eventually requires a feeling for the quality/style of music from other cultures. Colour photocopies of illustrations showing instruments of the past, and any readable books which give insight into music history… anything like this will stimulate children to look beyond their current horizons defined by family activities, computers and television fare. I had some percussion instruments and a thumb pianos which a waiting sibling could take outside for experimentation: if that child was inventive and good at keeping in time with maracas or maintaining an ostinato, a chance could be given to team the youngster with the student to enhance a solo at the studio recital. Stay open and watchful and you’ll pick up all sorts of ideas and strategies (not just from music teachers, either). 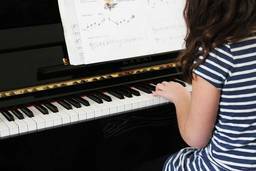 For more tips on creating a stimulating learning environment for private music lessons, please contact the expert contributor.